(Nanowerk News) Professor Kenichiro Itami, Yasutomo Segawa and Natsumi Kubota of the JST-ERATO Itami Molecular Nanocarbon Project and the Institute of Transformative Bio-Molecules (ITbM), Nagoya University have synthesized novel cycloparaphenylene (CPP) chromium complexes and demonstrated their utility in obtaining monofunctionalized CPPs, which could become useful precursors for making carbon nanotubes with unprecedented structures. CPPs consist of a chain of benzene rings and are the shortest segment of carbon nanotubes. Since their first synthesis and isolation in 2008, CPPs have attracted wide attention in the fields of materials science and supramolecular chemistry. Applying the basic concepts of chromium arene chemistry, Itami and his coworkers have performed the first selective installation of a functional group on CPP, which has previously been difficult due to multiple reactive arene sites on the CPP ring. By being able to selectively install and tune the functional groups on CPPs, it is envisaged that carbon nanotubes with new properties can be constructed by this method. One-pot selective monofunctionalization of CPP via a chromium complex. The study, published online on January 12, 2015 in the Journal of the American Chemical Society ("η6-Cycloparaphenylene Transition Metal Complexes: Synthesis, Structure, Photophysical Properties, and Application to the Selective Monofunctionalization of Cycloparaphenylenes"), illustrates the first synthesis, isolation and analysis of a CPP chromium complex, which enables a one-pot access to monofunctionalized CPPs. This outcome is believed to be a significant advance in the fields of both CPP chemistry and organometallic chemistry. Arenes are known to coordinate to transition metals and the corresponding metal complexes exhibit different reactivities relative to the free arene. CPPs, which consist of a chain of arenes, also reacted with chromium carbonyl to successfully generate the first chromium complex of CPP. Interestingly, the main product was a CPP with one chromium moiety complexed to one arene on the outer side of the ring, as confirmed by 1H NMR (nuclear magnetic resonance) spectroscopy, high-resolution mass spectrometry and X-ray crystallography. 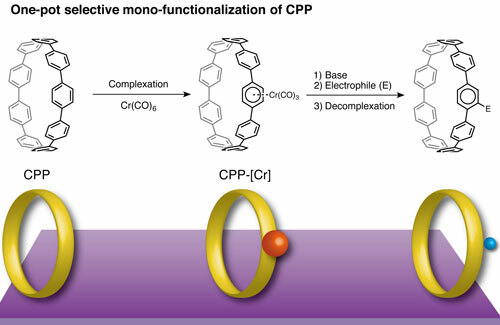 Upon finding that a monometallic CPP complex could be obtained, Itami’s team explored the possibility of obtaining monofunctionalized CPPs from this complex. Itami and Segawa describe the steps in achieving this. “This was not an easy task as chromium arene complexes are usually air and light sensitive, and CPP chromium complexes were no exception. But Natsumi worked persistently to obtain a pure crystal of the first CPP chromium complex,” says Itami. “We then performed the subsequent reactions in one-pot, to synthesize monofunctionalized CPPs after addition of base/electrophiles and removal of the metal from the CPP chromium complex,” says Segawa. Selective monofunctionalizations of CPPs i.e. installation of one functional group at a single position on the arene ring, are difficult to achieve as all carbon-hydrogen bonds on the arene rings are chemically equivalent. Direct functionalization of metal-free CPPs usually leads to multiple substitutions on the arene rings in an uncontrolled manner. 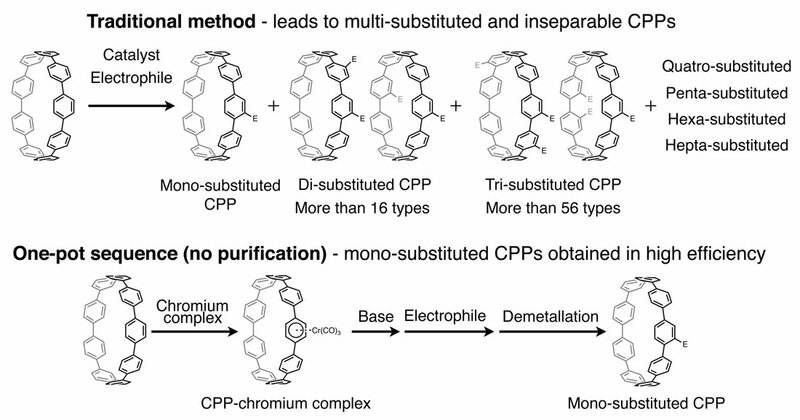 Despite CPPs being desirable components for carbon nanotubes, there has been no efficient method to obtain directly functionalized CPPs up to now.